Ayahuasca ceremony Peru. The service is basic because of the infrastructure of the Temple in Cusco city downtown, it’s on the last level (3rd floor), the house belongs to the Spanish (colonial) period. You will not have the comfort of a separate sleeping room as you would have at the Temple of the Sun – Patapata (Sacred Valley South). We have mats and blankets for you to stay warm inside the Ayahuasca ceremony at the “Temple of Light”. The Ayahuasca ceremony is done every day on 148 Herrajes street, one block from the Plaza de Armas (Main Square). The only Ayahuasca ceremony is at 6:00 pm (if you want to reschedule please talk to us). The work is exactly the same, we do not lower the quality of the Shaman or the assistant. Ayahuasca Peru, Ayahuasca ceremony in Cusco – Temple of the Light. This service is collective, maximum number per group is 6 participants; if it exceeds 6 participants, they will have another Shaman of specialty for each ceremony. The Ayahuasca ceremony is done every day. The shuttle picks us up at Caisae’s main office at the following times: 7am, 9am and 5pm; we head to the Retreats Temple, located 1 hour from Cusco city, the “Temple of the Sun”. 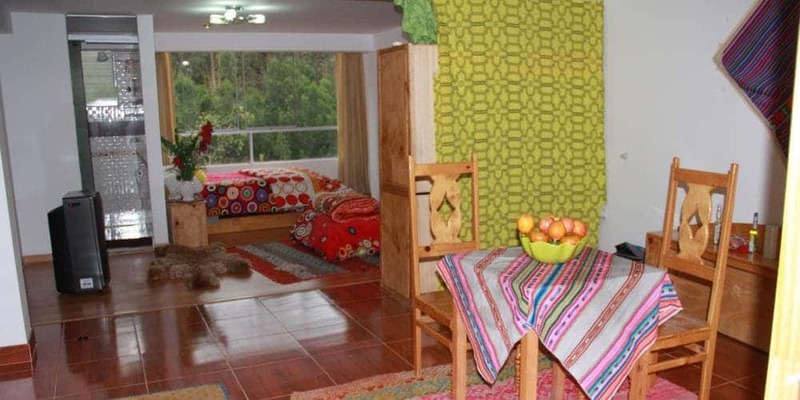 After the Ayahuasca ceremony, we will take you to your double room, the toilets and the hot showers are shared. The next day you will have a good organic breakfast. 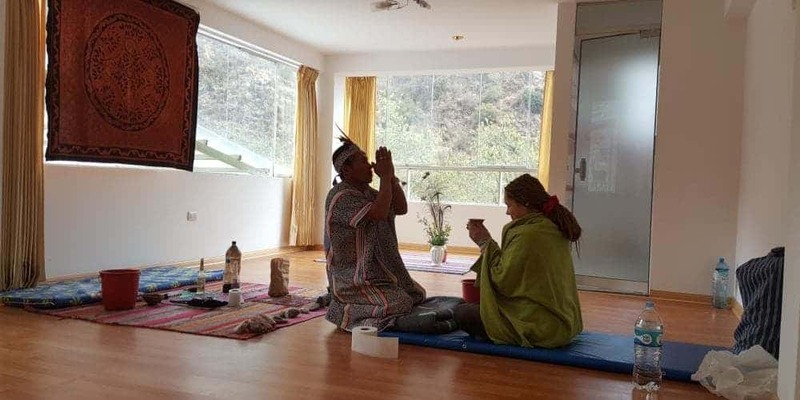 This Ayahuasca ceremony Peru service is personalized and closed, aimed at spouses, trusted friends and others. The ceremonies are done every day and are all completely private. The shuttle can pick us up at Caisae’s main office at: 7am, 9am and 5pm; we head to the Retreats Temple, located 1 hour from Cusco city, the “Temple of the Sun”. This service is very special and personalized, only for demanding clients, it is totally private. 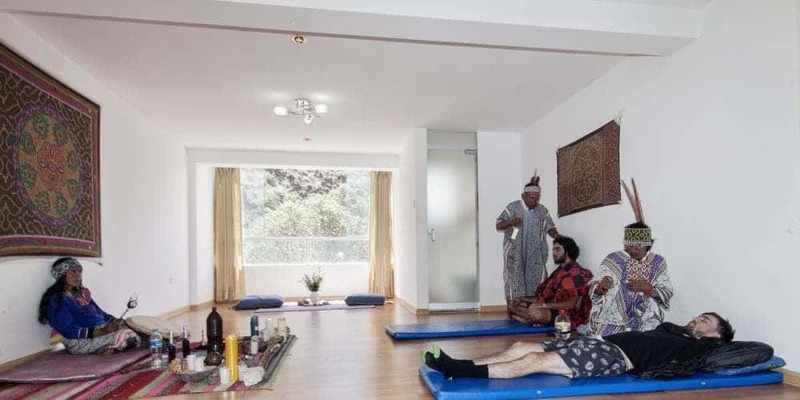 We can even do the Ayahuasca ceremony at your hotel, in the comfort of your room. All your ceremonies will be private; the shuttle can pick you up at your hotel at: 7am, 9am or 5pm, to go to the Retreats Temple, located 1 hour from Cusco city, the “Temple of the Sun”. The Ayahuasca ceremony is held every day, we suggest you begin your reservation procedures in advance. We have a special room of 45m2, fully furnished, with hot shower and private bathroom, both inside the room. 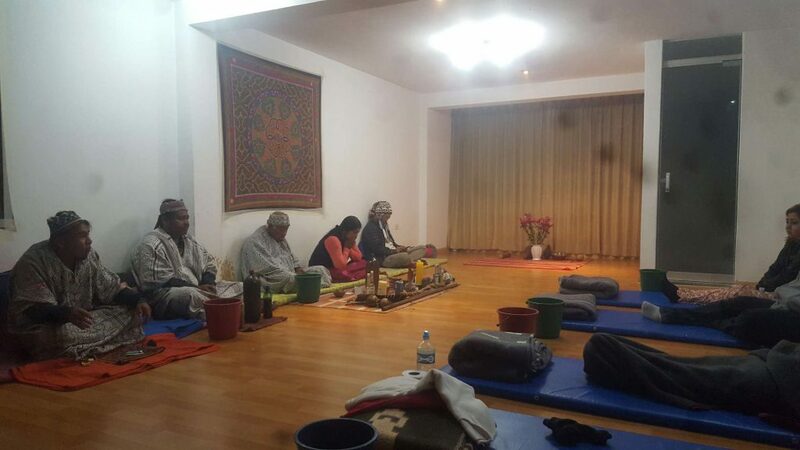 Ayahuasca Ceremony in Cusco: This ceremony has 6 different complete techniques that your body and mind need. We guarantee complete safety, a professional and reliable work during the Ayahuasca ceremony. You will be accompanied all the time by an experienced assistant-translator and an expert Amazonian Shaman. Each Master Healer has his specialty in different spiritual areas. We have 2 schedules for the ayahuasca ceremony, during the day or night. The experience lasts between 3, 5 or 7 hours. After drinking Ayahuasca does not leave any collateral effect: dizziness, vomiting, hangover, physical symptoms or mood disturbance. On the contrary, with greater spiritual energy, he can do his activities without any problem. Recommendations: We suggest you bring a medical certificate and/or an electrocardiogram attesting proper heart functioning, it is a requirement for taking Ayahuasca. If you have experience with Ayahuasca or similar plants, the medical certificate is not necessary as long as you do not have any heart condition whatsoever or psychiatric problem that requires lifelong medication. Read more information here Contraindications of Ayahuasca. Ceremony Ayahuasca Peru, professional work, Ayahuasca ceremony in Peru, Ayahuasca in Cusco. 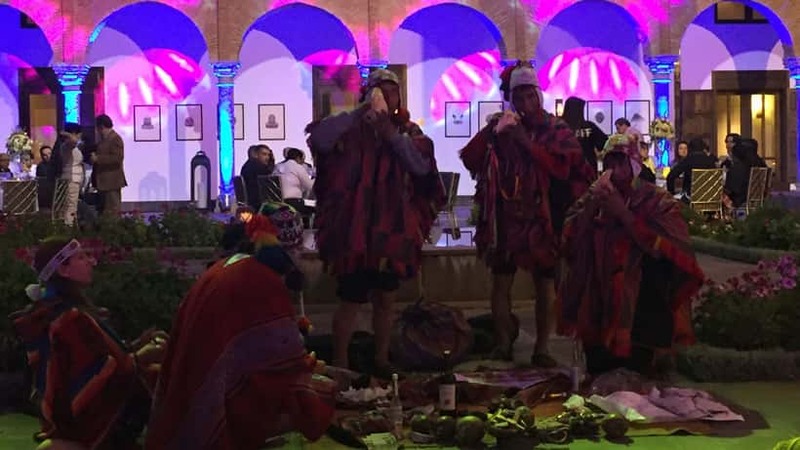 ceremonies of Ayahuasca Cusco. 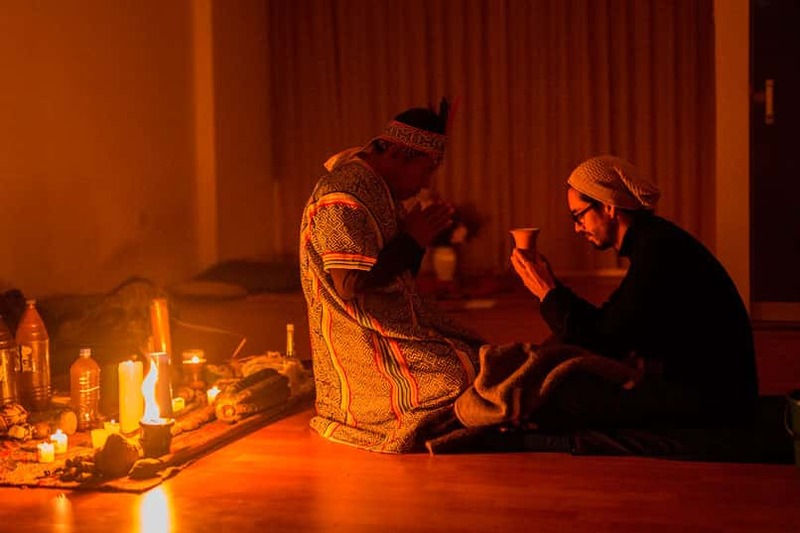 Peruvian Ayahuasca ceremony. Medicinal Volcanic Water.– Cleansing water composed of different natural minerals that detoxifies the immune system in general. Cleanses the esophagus, stomach, intestines and makes kidneys eliminate toxic residues, which are expelled orally, urinarily and anally. Preferably drink it before or the same day of your the Ayahuasca ceremony. Coca-Leaf Reading.– Used as an oracle, guidance, prediction of the future. The reading of coca leaves allows us a diagnosis and personal counseling. It is important to spot problems, deepen the knowledge of your situation and help with the whole healing process, can be a powerful addition to the Ayahuasca ceremony. Cleansing of Negative Energies.– We open the chakras to free the spirit, and prepare your inside and your outside before the Ayahuasca ceremony. We purify and cleanse the negative energies of karma, bad vibrations and spiritual sensations accumulated throughout the body. AYAHUASCA CEREMONY (1).– Ayahuasca Peru. The Ayahuasca ceremony heals the wounds of the soul, to transform your heart and mind through forgiveness. It purifies the blood, allows a deep spiritual, psychological and physical liberation. Offering to the Pachamama (Mother Earth).– We ask for improvement on the spiritual, health, love, work, family and more. We pray for life, food, well-being and for the constant creation. We thank for everything we have now, the benefits received from the sacred plant and from the forces of the universe. Flowering Bath.– It helps to activate life, channels and charges us with spiritual cosmic energy, connects with the great spirits of the universe. It attracts magical positive vibrations and energetic powers, brings personal protection against negative energies. – We suggest that you come to the office one day prior to the Ayahuasca ceremony, from 9 am to 9 pm. The idea is to drink the volcanic mineral water to detoxify your immune system, the main requirement before taking Ayahuasca. If you do not have time, you can drink the water the same day of the retreat at the earliest time (the cleansing takes 2 hours). Please avoid eating/drinking anything for at least 4 hours before the volcanic water intake. – You can do the 6 complete ceremonies or just the Ayahuasca ceremony plus the volcanic medicinal water and/or individually choose any ritual. Daily departures 7:00 am, 9:00 am and 5:00 pm. The retreat is available on the date you choose or schedule. Pick up from the shamanic center, round trip from Cusco to the CAISAE Retreats Temple (Sacred Valley South). Accommodation for 1 day (available for 1 or 2 people per room) at the Retreats Temple. Special vegetarian diet. 01 take of Ayahuasca and 5 Andean ceremonies. (Total 6 different techniques or ceremonies included). Different elements used in the ceremonies, offerings used throughout the healing retreat. Experienced spiritual teachers. Assistant, translator who speak Quechua, Spanish and English languages ​​for and during the healing retreat in Cusco, Peru. We allow you to take pictures on different sessions without interruption for personal record through the helper (optional). The whole retreat is carried by 4 different native Peruvian Shamans. Andean: from Qeros and Ausangate tribes; Amazonian: from the Ashaninkas, Shipibo or Machiguenga tribes. Meetings, consultations (group or individual) and interpretation of visions with the Shaman to share your experiences. Andean instrumental music for spiritual relaxation and meditation at the Retreats Temple. Private retreat: all the ceremonies will be completely private. Private VIP Retreat: all ceremonies are totally private and so are the volcanic water drinking and transport. You will have 1 spacious and fully furnished room of 50 m2, with private bathroom inside, heating and hot water. In the case of private retreats everything is independent, nobody else will join any of the ceremonies. 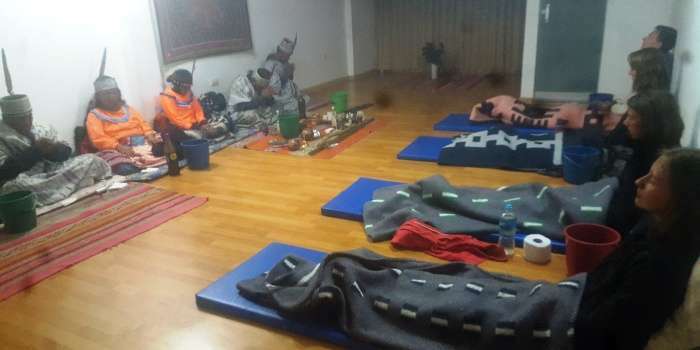 The maximum retreat group is 6 participants; if the group exceeds 6 participants there will be 2 shamans to conduct the Ayahuasca ceremonies in different rooms. We have capacity for a group of 30 people inside the 1200 m2 Retreats Temple. Ceremony Ayahuasca Peru, professional work, Ayahuasca ceremony in Peru, Ayahuasca ceremony in Cusco. Ceremonies of Ayahuasca Cusco. Peruvian Ayahuasca ceremony. A WHOLE DAY.- Ayahuasca Peru, Ayahuasca ceremony Cusco. You will be fasting, only allowed to drink water. We will pick you up at 7 am to go to our Retreats Temple located in Patapata, Sacred Valley South. Upon arrival you will come in to begin with the Coca Leaves Reading ceremony. 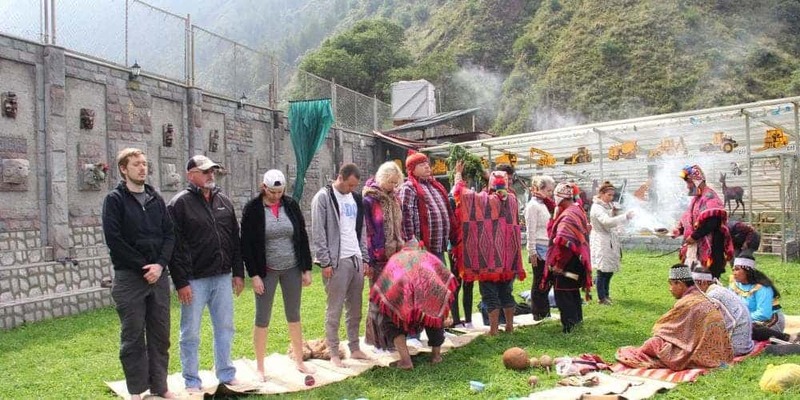 Then we continue with the Cleansing of Negative Energies ceremony given that it is very important to send them all away before the Ayahuasca ceremony. You will have a brief time to relax, meditate or concentrate. At 11:00 am we start the Ayahuasca ceremony. 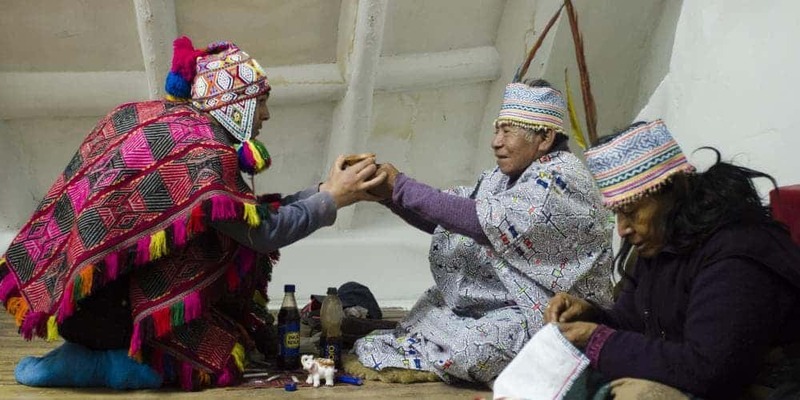 The Master Shaman says his prayers to ask permission from the sacred medicinal plant and from all the forces of the universe so that the Ayahuasca ceremony is in balance with you and nature. Then follows the Pachamama (Mother Earth) Ceremony, we thank it in order to align the energies in complete harmony with the earth. We finish with the Flowering Bath which serves for protection against negative energies. Finally follows a brief conversation to share your experiences, the Master Shaman can guide you to a complete understanding of the visions and the messages of the Ayahuasca. Then you will have something to eat. The return will be at approximately 7:00 pm. Ayahuasca ceremony Peru. Ayahuasca ceremony Cusco. Tupaq Inca Yupanqui, the Mystical Power of Plants.- Ayahuasca Peru. 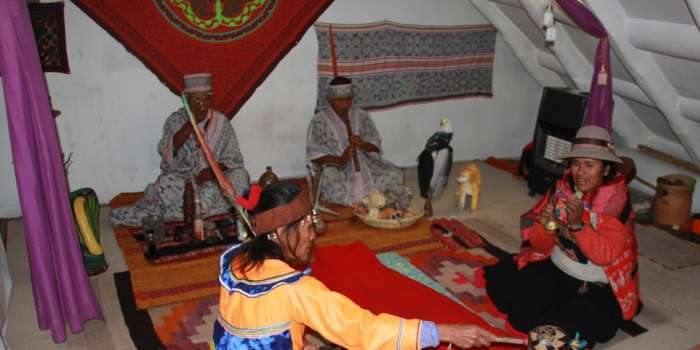 The Ayahuasca ceremony in Cusco has a transcendental importance in Inca history. Emperor Tupaq Inca Yupanqui had great faith in the visions and believed in the divine advice he obtained through the Ayahuasca ceremony. Due to the plant’s advice he was able to conquer Ecuador, expanding the domains of his father in South America. He was a great mystical believer, confident on the mysterious power of plants. Through the Master Shamans he connected with the Ayahuasca, the Wachuma (San Pedro) and made Andean offerings to the heavenly Gods. 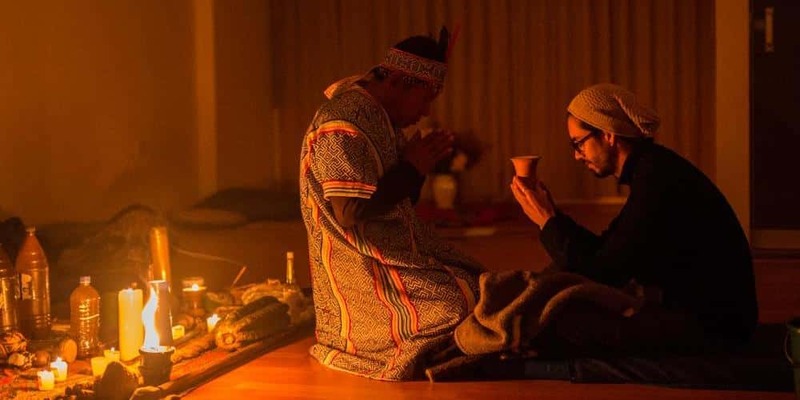 The Ayahuasca ceremony was his guide and he found answers to his questions, he was connected with the forces of the universe and spirits, just like his father Pachacutec and his son Huayna Capac. Pachacutec was a great warrior and transforming leader of the empire. History tells that from the beginning of the war he was in great disadvantage of soldiers, in a ratio of 1 to 3, when his soldiers receded almost losing the battle against the Chancas. Pachacutec was filled with courage and knew from his Ayahuasca ceremony that he will win the war. Leading the ranks with his bright eyes full of light, he said, motivating his soldiers “I am the son of the Sun, the stones will become warriors, the energy of the Gods and the universe is in my favor”, and they won indeed. According to history, 20000 Chancas died and only 8000 Cusco soldiers, in the planes of Yawarpampa. Reference: html: // tawantinsuyo-the-medicine-of-the-Incas. 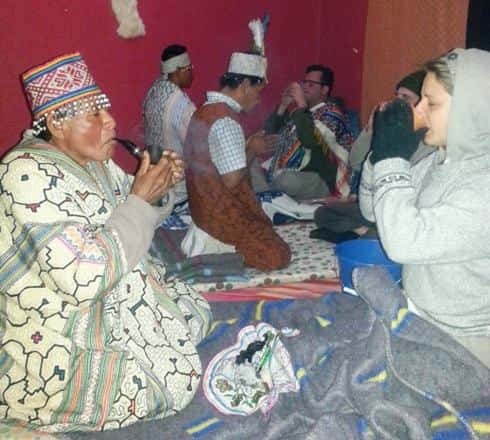 Ayahuasca Ceremony in cusco professional and responsible work with shamans of the jungle | Ayahuasca Ceremony in peru, Ayahuasca ceremonies Peru Cusco.